Ever since he launched his T for Tapas challenge on Twitter, where he and a friend travelled the length of the UK in a giant T shape, cooking up tapas at seemingly random locations, I have been a fan of Omar Allibhoy. While I'm none too fond of shopping excursions in Westfield, I do rather like the Tapas Revolution bar there. So when I was asked if I would blog some recipes he wrote in conjuction with Olives from Spain, I jumped at the chance. I think Omar is great and I absolutely adore olives, so as far as I was concerned, I was onto a winner. I must admit, I've tweaked the recipe slightly to make it my own, but it is essentially a Spanish version of a French Coq au Vin, and I think it is in many ways, nicer. The sherry and olives add a wonderful, rounded flavour to the dish and complement the tender chicken thighs perfectly. If you can, make sure you use Spanish queen olives. Mine came stuffed with almonds, which went beautifully with the chicken. I also used miniature Couchillo olives, which are my absolute favourite black olives at the moment, for extra flavour and contrast. Heat a large, heavy-bottomed pan, then dry fry the pancetta (some of its fat will melt) until golden. Remove from the pan, leaving a little of the molten fat behind then place the chicken thighs skin-side down in the pan to brown the skins. Turn them over and fry on the other side to seal the meat, then set aside. Thinly slice the onion & garlic and fry these too in the pan until soft and translucent. At this point, pre-heat the oven to 200°C, and while it is heating up, stir the flour into the onions and slowly add the chicken stock, stirring continually until you have a sauce. Add the Fino sherry and season with a little salt and pepper. 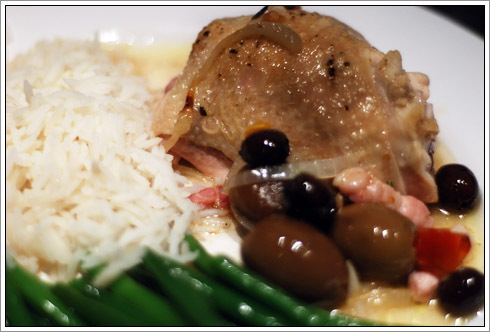 Arrange the chicken thighs skin side up in an oven-proof dish, then scatter over the pancetta and assorted olives. Pull the rosemary leaves off the stem and distribute evenly, then pour the sauce over the chicken. Cover with foil and roast in the oven for 1 hour 20 minutes. Remove the foil and roast for a further 10 minutes. Before serving, pierce the chicken to make sure it is cooked and the juices run clear. Ideally the chicken itself should be so tender that it falls off the bone. I served mine with French beans and basmati rice while sipping on a beautiful white Rioja.